When working or playing in cold temperatures, you wear apparel designed to protect you from those conditions and keep you warm. But there are more things to consider than material and insulation. 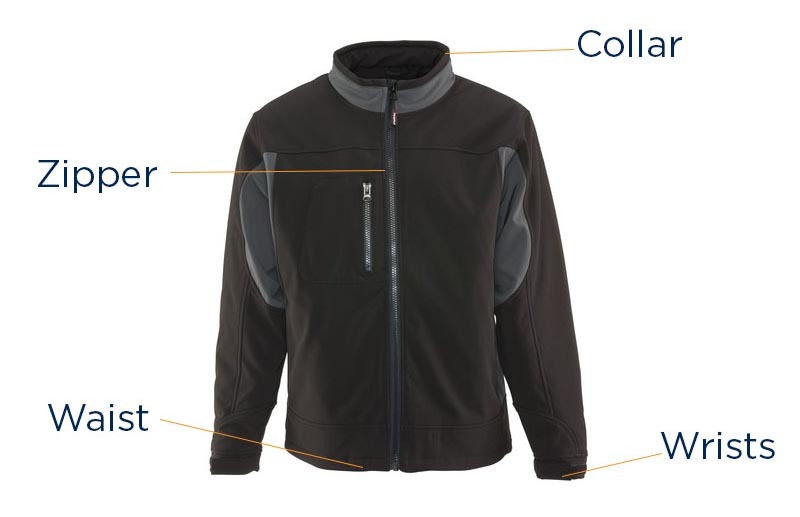 Each jacket has a number of draft points – areas of the jacket that are vulnerable to cold penetration. It is important to know what these are and how the jacket you are considering addresses potential exposure to drafts. Draft points are areas of the jacket where drafts can enter, bringing in cold air. These are the waist, wrists, zipper, and collar. The waist as a draft point is a concern because it leaves the kidneys vulnerable to cold. Kidneys are part of your core and vital organs – if your body senses your core is cold, it reduces blood circulation to your extremities to warm your core. Your extremities take the hit to protect your vital organs and are often the first areas to succumb to frostbite1. Look for jackets with an adjustable inner waist seal you can tighten against drafts. Longer jackets that fall below the hips also help protect the kidneys against drafts – many jackets feature an extended back (see image on right ) for the sole purpose of protecting your kidneys from drafts. A lined base layer securely tucked into your pants is a great additional measure to protect against cold that penetrates through the waist. The cuffs of your jacket can help protect you from cold. Stretchy knit cuffs (see center image below) not only close off your sleeves to protect from drafts, they secure your sleeves in place so they don’t slide up your arm, exposing your skin to the cold. 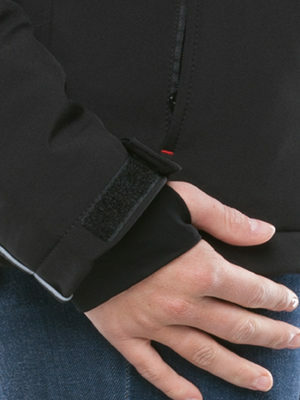 Some base layers and jackets come with cuffs designed to hook over your thumb (see image on left below), offering more security from drafts. Other types of seals at the wrists include elastic cuffs that are meant to stay tight and Velcro closures (see image on right) that can be adjusted tight or loose depending on how much protection you need. By their nature, most zippers are not a solid seal against the cold and wind. 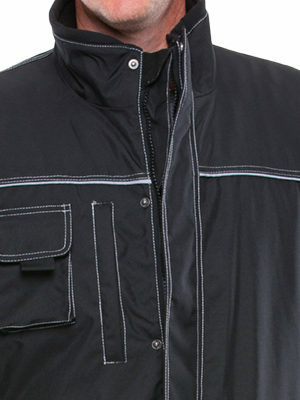 Plus, the zipper area is protecting the largest opening on any jacket, vest or coveralls. 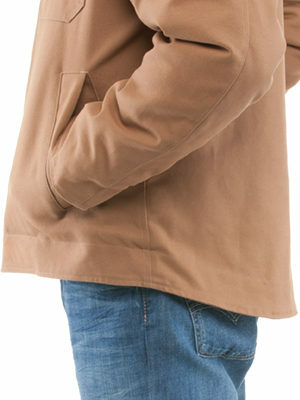 Flaps under the zipper and over the zipper (on the outside – see image on right) help protect this draft point from cold penetration. Jackets designed for the harshest conditions usually have a flap that snaps over the zipper. This reduces cold entering through the teeth of the zipper and keeps your core warm – protecting your vital organs and extremities simultaneously. One of the most overlooked areas for a draft to enter is the collar because style often wins out over functionality. However, if your neck and throat are exposed to drafts, we all know how uncomfortable and colder we can feel. This can be prevented a number of ways. Stand up collars made of soft fleece or fur help prevent drafts from hitting the skin because they can be pulled up to protect your neck and throat. They also can hold the position and not fold down again, like a knit polo shirt. 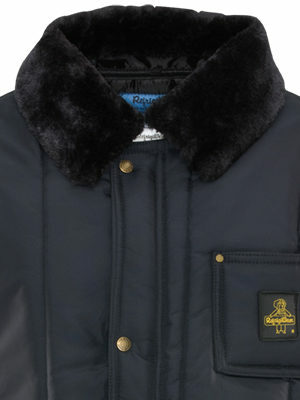 Jackets with lined hoods are another feature that helps reduce the drafts at the collar. Adding a scarf or neck gaiter also protects the neck area against drafts and are recommended if you are facing extremely cold conditions. If left unaddressed, draft points reduce the effectiveness of your jacket. To make sure the jacket protects against the conditions you will be in, find out what features the jacket has to protect your draft points. If the jacket itself doesn’t address it, accessorize and layer appropriately to reduce cold penetration. There is no one perfect solution to protecting yourself against draft points, but ignoring them means sacrificing warmth and comfort.